The Pied Piper. And on the bar our stack of books. Taken at ISO 1600, f4.2 and 1/20s with image stabilization, distortion corrected in Adobe Camera Raw 8.2. 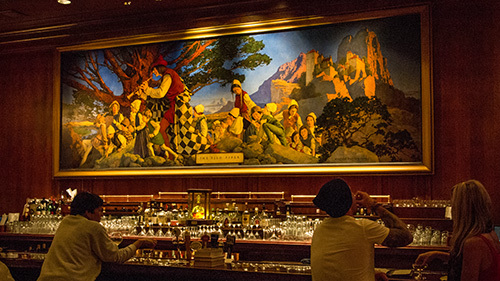 Over the years, we've had more than a few business lunches under Parrish's illustration. We always thought it set the right tone. But we've also taken the next generation there on turning 21 -- for the same reason. After a celebratory toast or two, we would point out the painting and ask them if they remembered the story. A town overrun with rats is saved by the Piper who leads them all to the river where they drown. But when the elders refuse to pay him what they had promised, he leds their children away as well. The Brothers Grimm, you might have guessed. Parrish illustrates the moment in the story when the children follow the Piper, the town of Hamelin on the hill to the right behind them. One boy smiles at the viewer, the older children help the younger ones over the rocks. They will never be seen again. Our Piper has returned. We raised a glass to him, the patron saint of creatives, to welcome him home.